Connecto VPN Reviews 2019 - Why 4.0 Stars? What is your opinion on Connecto VPN? Connecto VPN is easy to install and use. It only takes a few seconds to download and configure its software. Although there are a few extra steps involved in the setup process, there is a simple picture-based installation guide that explains it in detail. Beginners will find it easy to set up once they’ve read the guide. Connecto VPN uses the Pritunl VPN client. It’s a basic interface, but in this case, that’s a good thing. All I needed to do was install Pritunl from Connecto’s website, download and import my chosen server’s profile, and sign in. You need to follow the installation guide closely because it will supply you with the unique user ID and password you need to sign in. You can’t use the credentials with which you created your Connecto account. You have three servers to choose from, one each in the US, Germany, and France. You’ll need to download and import a separate config file for each server, but this only takes a few seconds. Advanced users can configure their VPN settings by editing the server’s config file, but there’s no need to. It works well with no customization. Connecto VPN offers three budget-friendly subscriptions. You can sign up for a one-month subscription, a six-month subscription, or a 12-month subscription. If you sign up for a six or 12 month subscription, you’ll enjoy a nice discount off the monthly cost. This makes the 12-month subscription the best deal if you’re looking to commit to a VPN. It accepts VISA, MasterCard, PayPal, and Bitcoin, with BitCoin being the most secure payment method. Connect VPN uses a third-party payment gateway, which means they don’t store any of your card details. Connecto offers customer support via email, social media, and its support ticket system found in the ‘my account’ area. Its Facebook account is run by its parent company, Vee Security. 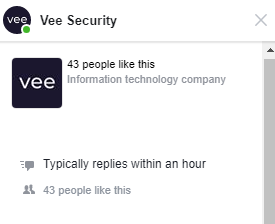 You’ll need to message Vee Security if you want to get in touch via Facebook. You can expect to receive a response on Facebook within about an hour, and the customer representatives are also active on Twitter. Its Twitter account is regularly updated with deals and service announcements. The customer support staff are friendly, professional, and helpful. Connecto VPN is a new, easy-to-use VPN with room to grow. Its Pritunl UI is easy to use, but it lacks a lot of the features that premium VPNs offer. At first glance, installation seems a little difficult, but Connecto’s helpful guides make it a quick and painless process. If you’re looking for a service with thousands of servers and an easy, one-click app, Connecto VPN isn’t there yet. It only has three servers to choose from, with a fourth opening soon. But if you’re happy with a simple service at budget prices, I would recommend trying it out. Connecto VPN is new to the market. At the moment, it operates three servers, one each in the US, Germany, and France. According to its website, a new server in Singapore is on its way. It’s a simple, low-cost VPN. It keeps a strict no-logs policy, but unfortunately there is no automatic kill switch built into its app. Connecto VPN’s website is available in three languages; English, Japanese, and Russian. The service isn’t limited to these three languages though. I was able to use Google Chrome to translate it into almost any language. My first task after installing Connecto VPN was to find out if it could bypass Netflix’s geoblocks and unlock Netflix US. I also tested some other popular streaming services to find out what it could do. Netflix: No. Netflix detected that I was using a VPN as soon as I opened a stream. Hulu: No. Connecto VPN wasn’t able to bypass Hulu’s VPN blocks. HBO GO: Yes. I could stream HBO GO in high-definition. BBC iPlayer: No. Because it only has servers in the US, Germany, and France, I wasn’t able to use Connecto to watch any of my favorite British streaming services. While I was streaming HBO GO, I noticed that my connection was quite quick. I wanted to put it through its paces to find out exactly how fast it could go. Connecto VPN doesn‘t have any servers near me, so I tested out its US server instead. I expected to see some speed loss because my data was travelling farther than it would travel to my ISP’s server. It also takes extra time to encrypt and decrypt your internet traffic when you’re connected to a VPN. For comparison, my speed before I connected to a VPN was 3.4 Mbps download, and 0.82 Mbps upload. My ping was 37 ms. When I connected to Connecto’s US server, my download speed increased to 5.4 Mbps. My ping also increased to 268 ms, but this is within the normal limit and I didn’t notice any difference while I was browsing. My upload speed dropped a little to 0.73 Mbps, but again, this wasn’t enough to notice any difference. I suspect that Connecto VPN helped me to bypass some congestion or throttling on my ISP’s network. But, even if my network had been running at full-speed, 5.4 Mbps is really quick for a VPN connection travelling from Australia to the US. Security - Is Connecto VPN Safe? 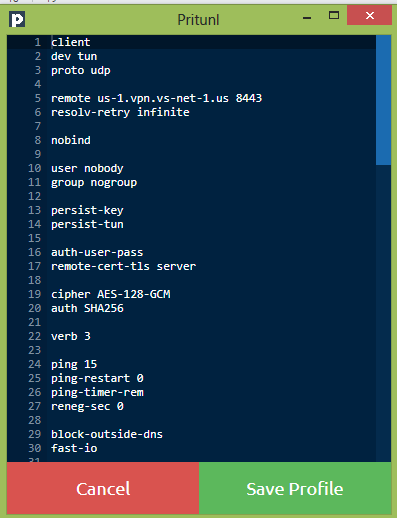 Does Connecto VPN Keep Logs? Connecto VPN doesn’t log any of its users’ data. You don’t even need to provide an email when you register unless you want to use it to recover your account in case you lose your password. It’s based in Estonia, which is outside the jurisdiction of the 5/9/14-Eyes Alliance. Estonia ranks as the top European country in the Global Cybersecurity Index. It is a world leader in the research, development, and management of cybersecurity solutions and systems. Does Connecto VPN Have a Free Version? No, Connecto VPN does not offer a free trial. Connecto VPN offers a 14-day money-back guarantee. If you’re unhappy with your service, you will need to contact them via email to request a refund. Is Connecto VPN Compatible with My Device? You can connect up to five of your devices simultaneously with one account. Connecto VPN is simple and well-designed. Its Pritunl UI is easy to navigate, even if you’re a beginner. Unlike most VPNs, though, you’ll need to download both Pritunl and the config file for the server you want to use. You can download them by clicking a link in the installation guide. Both files only take a few seconds to download. My only criticism is that Pritunl doesn’t remember your login credentials, and they’re only available from the installation guide. This means you’ll need to either open the guide every time you sign in, or store them on your hard drive. This isn’t as secure because anybody who gains access to your device could find the file. Once you’re logged in, you’re ready to go. It’s really as simple as that. If you want to use a different server, you’ll need to download and import the config file for that location. It’s a straightforward process and only takes around two minutes to complete. Connecto VPN’s website doesn’t have a FAQ or help section, so if you run into any problems, you’ll need to reach out to customer support. You can contact them via email, by creating a support ticket, or messaging them on social media. I tried to search Google for some troubleshooters, but it didn’t yield any relevant results. Connecto VPN doesn’t offer as many advanced features as its premium counterparts, but it’s a brand new service. This means that users who are subscribing for low prices today could benefit from new features and upgrades as it expands its service. Connecto VPN’s best feature is its budget-friendly subscription options, but I’m a big fan of its user interface, too. It has very few features, but its straightforward, no-frills approach works. It only operates three servers at the moment, so your choice of virtual locations is limited to the US, Germany, and France. If only need a VPN for security, this won’t be a problem. If you want to use your service to stream Netflix and bypass geoblocks, this isn’t the best VPN for you. Instead, I’d recommend looking at NordVPN. It operates a huge global network of servers, and it can bypass geoblocks and VPN blocks with ease. However, if you’re looking for a fast, cheap, and secure VPN to mask your identity online, I recommend giving Connecto VPN a go.